The main entrance to the Bahá’í Gardens in Haifa is at 80 Hatzionut Avenue, near Shifra Street. This gate gives access to the Shrine of the Báb and surrounding gardens. If the parking spaces on Hatzionut Avenue and Shifra Street are insufficient, there is a public lot on 2 November Street, which branches off Hatzionut Avenue a few hundred meters west of the entrance to the gardens. The viewing balcony which overlooks the gardens is at 61 Yefe Nof Street, at the end of the Louis Promenade. The special entrance for the Panorama Tour is at 45 Yefe Nof Street, 120 meters west of the viewing balcony. A large public parking lot is located between Hanassi Avenue and Yefe Nof Street, and limited parking may also be available on Yefe Nof Street. The German Colony Plaza is at the junction of Ben Gurion Avenue and Hagefen Street. 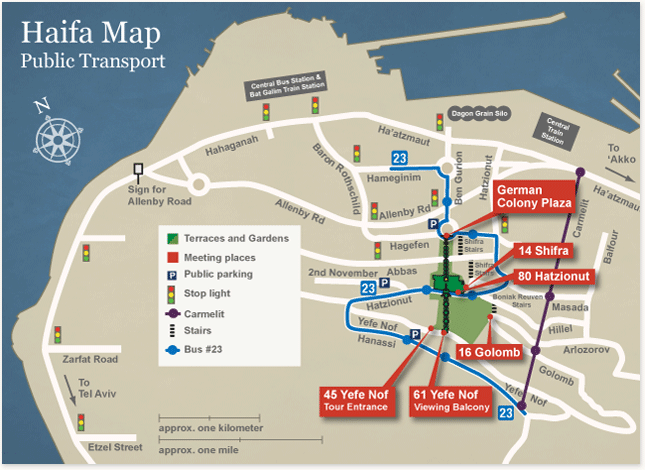 About a hundred meters away, next to the Haifa Tourist Board, is a large public parking lot, which can be entered from Allenby Road. All entrances to the Bahá’í Gardens in Haifa are served by bus 136 (23 on Saturdays). For the entrances on Yefe Nof Street, it is necessary to alight at one of the stops on Hanassi Avenue and walk a few hundred meters.